Parents pass on traits to their children through their genes. Genes are the blueprint for our bodies. Almost every cell in the human body contains a copy of this blueprint, mostly stored inside a special sac within the cell called the nucleus. Genes are part of chromosomes, which are long strands of a chemical substance called deoxyribonucleic acid (DNA). Therefore, genes are made up of DNA. A DNA strand looks like a twisted ladder. The genes are like a series of letters strung along each rung. These letters are used like an instruction book. The letter sequence of each gene contains information on building specific molecules (such as proteins or hormones, both essential to the growth and maintenance of the human body). The nucleus of a eukaryotic cell contains the DNA, the genetic material of the cell. The DNA contains the information necessary for constructing the cell and directing the multitude of synthesis tasks performed by the cell in the process of life and reproductionInside the nuclear envelope is the chromatin, meaning "colored substance" after the early experiments in which that material was highly colored by the staining techniques used. 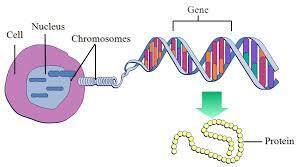 Chromatin consists of DNA associated with proteins which forms long strands called chromosomes. A gene is the basic physical and functional unit of heredity. Genes, which are made up of DNA, act as instructions to make molecules called proteins. In humans, genes vary in size from a few hundred DNA bases to more than 2 million bases. The Human Genome Project has estimated that humans have between 20,000 and 25,000 genes. Every person has two copies of each gene, one inherited from each parent. Define gene, allele and genome. allele - An allele is one of two or more versions of a gene. genome - A genome is an organism's complete set of DNA, including all of its genes. Describe: Give a detailed account. 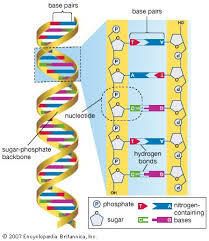 Nucleotides are attached together to form two long strands that spiral to create a structure called a double helix. All organisms must duplicate their DNA with extraordinary accuracy before each cell division. DNA replication begins with the "unzipping" of the parent molecule by the enzyme helicase as the hydrogen bonds between the base pairs are broken. Once exposed, the sequence of bases on each of the separated strands serves as a template to guide the insertion of a complementary set of bases on the strand being synthesized. The new complementary strands are put back together with the enzyme DNA polymerase. Some DNA polymerases also have proofreading ability; they can remove nucleotides from the end of a growing strand in order to correct mismatched bases. When the process is complete, two DNA molecules have been formed identical to each other and to the parent molecule. 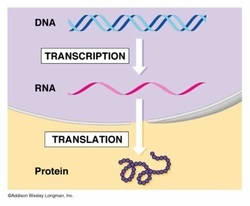 Protein synthesis requires two steps: transcription and translation. Translation is the process of translating the sequence of a messenger RNA (mRNA) molecule to a sequence of amino acids during protein synthesis. The genetic code describes the relationship between the sequence of base pairs in a gene and the corresponding amino acid sequence that it encodes. In the cell cytoplasm, the ribosome reads the sequence of the mRNA in groups of three bases to assemble the protein. Radioactive materials that decay spontaneously produce ionizing radiation. Ionizing radiation has sufficient energy to break some chemical bonds. Any living tissue in the human body can be damaged by ionizing radiation. The body attempts to repair the damage, but sometimes the damage is of a nature that cannot be repaired or it is too severe or widespread to be repaired. Also mistakes made in the natural repair process can lead to cancerous cells. The most common forms of ionizing radiation are alpha and beta particles, or gamma and X-rays. Individuals with sickle cell have been observed to portray malaria resistance. Generally, this is a harmful mutation since sickle blood cells are not as effective as normal cells in their functioning. In regions where there are increased cases of malaria, this mutation is favorable as individuals with blood cells that are sickle shaped are not likely to contract malaria. Lactose intolerance has made it simpler to wean young children. Nevertheless, human beings still like drinking milk. People found out they could use milk products as they had developed lactose tolerance due to genetic mutation. Lactose tolerance even has a strong relationship with being descendants of cultures that used milk like a food. The discovery of double-helix structure of DNA is to science what Mona Lisa is to painting. It has been called the single biggest discovery of all times. But it was not just stumbled upon - it was a race. Your genome, every human's genome, consists of a unique DNA sequence of A's, T's, C's and G's that tell your cells how to operate. Thanks to technological advances, scientists are now able to know the sequence of letters that makes up an individual genome relatively quickly and inexpensively. Mark J. Kiel takes an in-depth look at the science behind the sequence. Paul Andersen describes the molecular structure of DNA. He describes the major parts of a nucleotide and explains how they are assembled into a nucleic acid. The nitrogenous base, deoxyribose sugar and phosphate group make up a single nucleotide. The 5' and 3' end of DNA is described. The importance of hydrogen bonds in the 3-dimensional shape is also included. RNA is synthesized from DNA, and enters the ribosome where protein translation and synthesis occurs. This video looks first at the structure of DNA before going on to describe how DNA carries out its four major functions: the storage of information; the replication of information; creating slight changes in the information through mutations that forces of natural selection act upon; and the translating of information into the proteins that define an individual. The DNA in just one of your cells gets damaged tens of thousands of times per day. Because DNA provides the blueprint for the proteins your cells need to function, this damage can cause serious issues—including cancer. Fortunately, your cells have ways of fixing most of these problems, most of the time. Monica Menesini details the processes of DNA damage and repair.